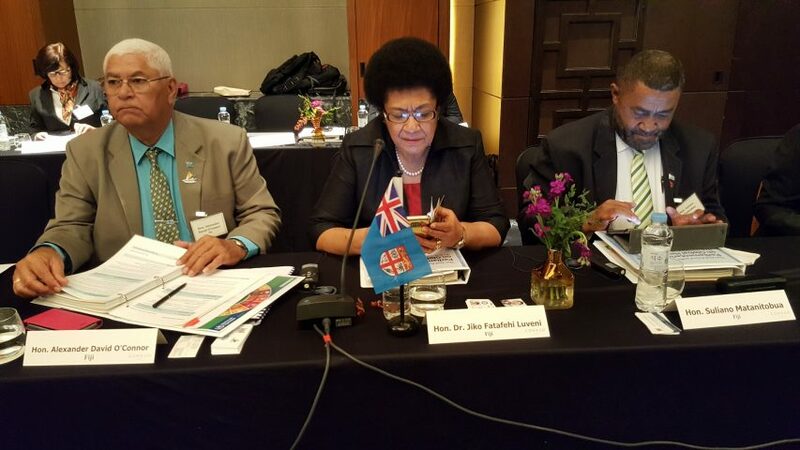 Fiji was welcomed for the first time at the Asia-Pacific Parliamentarian Forum on Global Health Meeting in Seoul yesterday, Thursday 24th November 2016.
WHO Regional Director for the Western Pacific, Dr SHIN Young-soo, while delivering the opening remarks, acknowledged the participation of the Fijian delegation led by the Speaker of Parliament, Hon. Dr Jiko Luveni. More than 70 participants from 17 countries are attending the two days meeting which ends today. Hon. Dr Luveni presented the steps taken by parliament in the progressing of the SDGs and shared experiences in prioritizing health agendas with the aim of “leaving no one behind”. “It has undertaken a number of initiatives towards progressing the SDGs based on national priorities although there are challenges in its achievement,” Hon. Dr Luveni said. The Speaker also chaired the session on multi-sectoral action and international cooperation for achieving health in the SDGs and the formulation of the draft “Seoul Declaration” to be adopted at the end of the meeting.